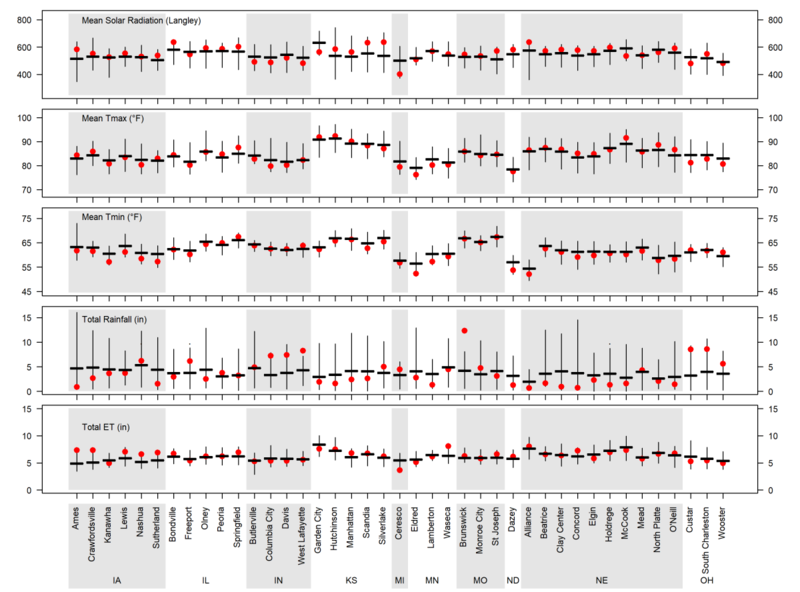 Simulations of 2017 real-time crop stage are performed for 41 locations across the Corn Belt using the UNL Hybrid-Maize model in collaboration with faculty and extension educators from 10 universities. Additionally, we provide forecasts of end-of-season corn yield potential for all major irrigated corn growing regions and for rainfed corn in Nebraska, Kansas, North Dakota, and Minnesota. View data for the July 18 corn yield forecasts. (Watch for later simulations in CropWatch.) Details on Hybrid-Maize and the underpinning methodology to simulate phenology and forecast end-of-season yields, as well as details on interpretation and uses of yield forecasts, is described in a previous article. The states experienced near-normal temperatures in the last month (June 17 to July 17). Rainfall was highly variable across locations, with above-normal rainfall in Indiana and Ohio but below-normal rainfall in Nebraska, Iowa, and North Dakota. A summary of weather conditions during the last month is shown in Figure 1. Corn has already reached silking throughout much of the Corn Belt, except in northern areas (North Dakota, Minnesota, northern Iowa, Indiana, and Ohio), which are running behind the rest of the region (Figure 2). Figure 2. 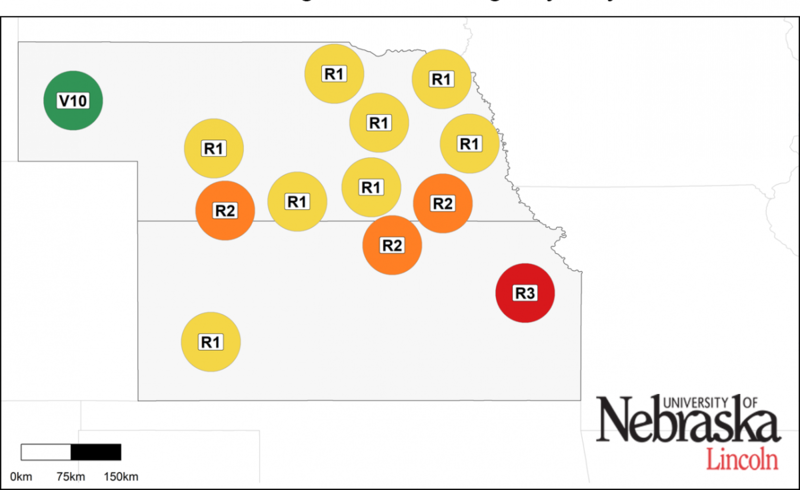 Simulated crop stage for irrigated (left) and rainfed corn at each location, as of July 18. Vn: vegetative stage (nth leaf), R1; silking; R2: blister; R3: milk. 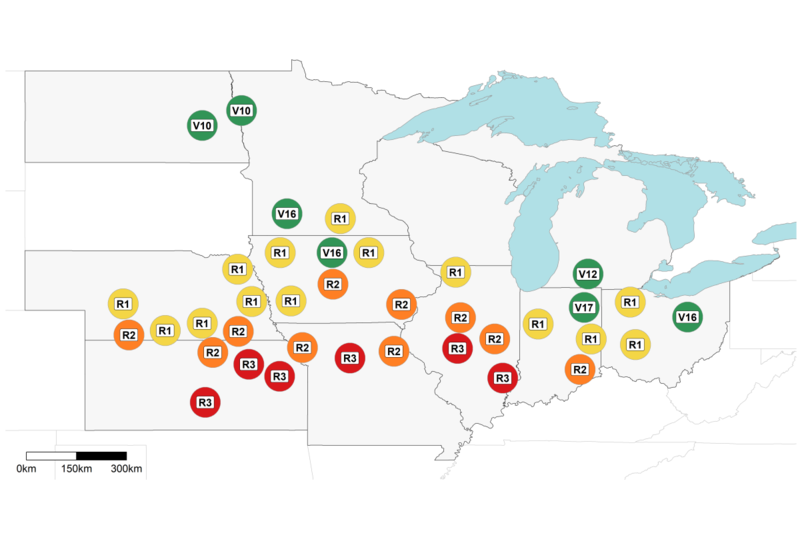 The range of forecasted irrigated corn yield potential for each location, as well as the probabilities for yields above, near, or below average are shown in Figures 3 and 4. The range of forecasted irrigated yields is wide and includes the long-term average yield at all irrigated sites (Figure 3). 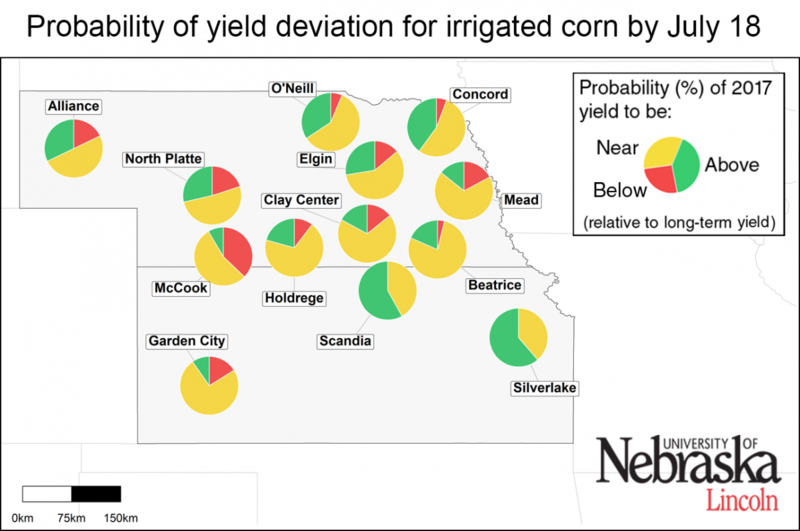 There is a low (<20%) probability of below-average yields at all irrigated locations, except for one site in southwestern Nebraska (Figure 4). However, it is too early in the growing season to tell if forecasted irrigated yields will remain near or above long-term average yields. Figure 3. (right) Vertical lines indicate the range of forecasted 2017 corn yield potential by July 18 based on average planting date in 2017 at each location. Horizontal lines indicate the 25th and 75th percentiles of the yield distribution (associated with respective adverse and favorable weather scenarios during the rest of the season). Long-term (2005-2016) average yield potential at each location is indicated with a blue square. Figure 4. Probability of the 2017 yield potential to be below (≤10%, red color), near (±10%, yellow color), and above (>10%, green color) than the long-term (2005-2016) average yield potential at each location. Separate maps are shown for irrigated (top) and rainfed corn (bottom). The larger a color section is within a pie chart, the higher the probability that corn yield potential will be in that category. 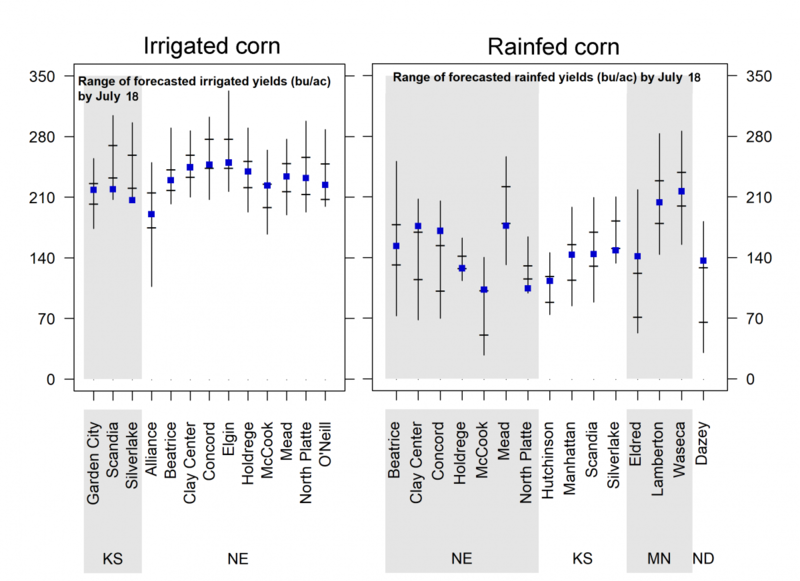 For rainfed corn, the range of forecasted yields is wide (Figure 3), but there is a relatively high probability (>66%) of below-average yield at three locations in Nebraska (Concord, Clay Center, and McCook) (Figure 4). The scenario is less clear across the other rainfed sites. The range of forecasted irrigated and rainfed yield potential is wide; hence, these early forecasts should be taken with caution. Growing conditions up to now indicate low probability of below-average yields at most irrigated sites. End-of-season yields are more uncertain for rainfed sites, although there is already a high chance of below-average yield at three rainfed sites. These forecasts do not take into consideration problems with stand emergence, hail/flooding damage, replanting situations, disease, or nitrate leaching and, therefore, in fields negatively affected by these constraints actual yields will be lower than these estimates. 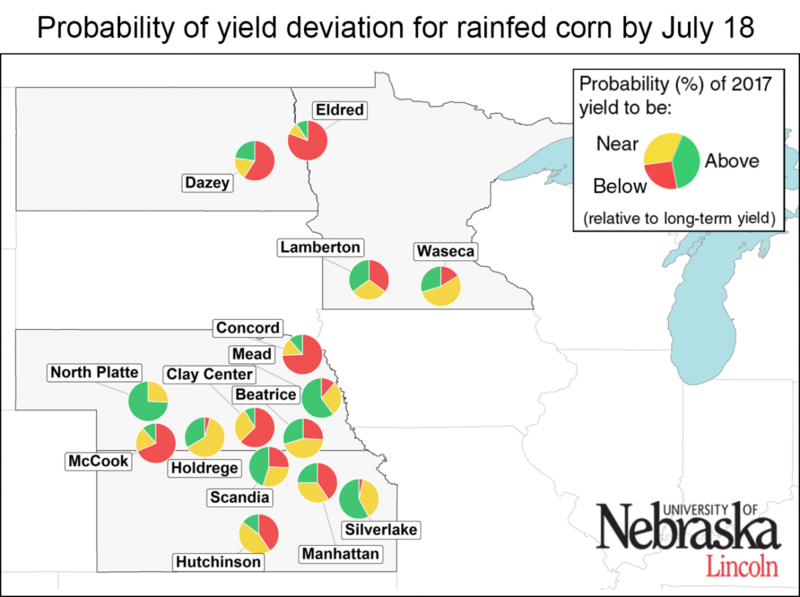 It is important to keep in mind that the yield forecasts are not field specific and instead represent an estimate of average on-farm yield for a given location and surrounding area in absence of the yield-reducing factors cited here. We will follow up with further forecasts in early August.